Isn't Shelby the cutest?? We were introduced to each other via Oh Hello Friend's Lovely Package Exchange this past Christmas, and I was so excited to get paired with someone who loves vintage like I do. Shelby put together a super-thoughtful box of goodies for me, including a gorgeous cake cutter that I've been using a ton since baking up all these Valentine's Day cakes. 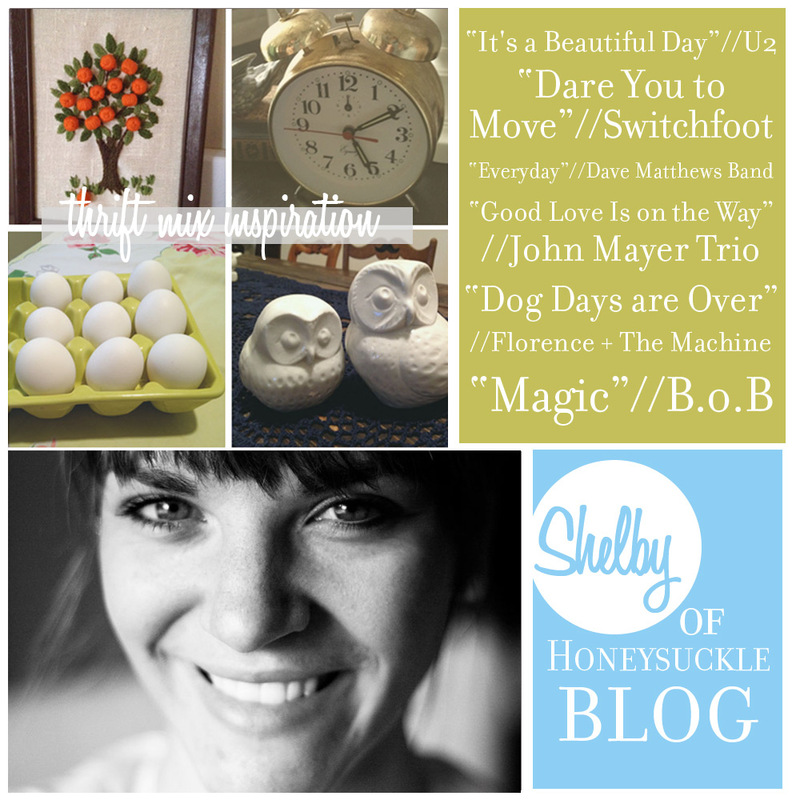 Her blog, Honeysuckle Blog, is a great resource for inspiration, and I've loved catching up on all the post I've missed since before I knew about her. She's also on her way to becoming a mommy (congrats! ), so be sure and stop by and wish her and her growing family well! Also be sure to check out her Etsy store, which is stocked with all kinds of vintage loveliness. "These songs are surely an eclectic mix, but so is my style. So many of my projects are done on a small budget, which often requires thrifting, but sometimes I just don't feel like it. Getting a glimpse of one of my favorite thrifted items (each one snagged for less than $1!) or hearing the right song can boost my mood and remind me that each day is a gift that I should use to get up and get things accomplished." Um...aren't those white owls awesome? Thanks, Shelby, for stopping by and sharing with us! Oh how fun a little thrift mix! Love starting my day with good music!